iGive.com is changing online shopping for good. Now more than ever, smart shoppers are looking for ways to stretch every dollar. In these uncertain economic times, we all face hard choices as we plan for special occasions, holiday gifts, and charitable giving. 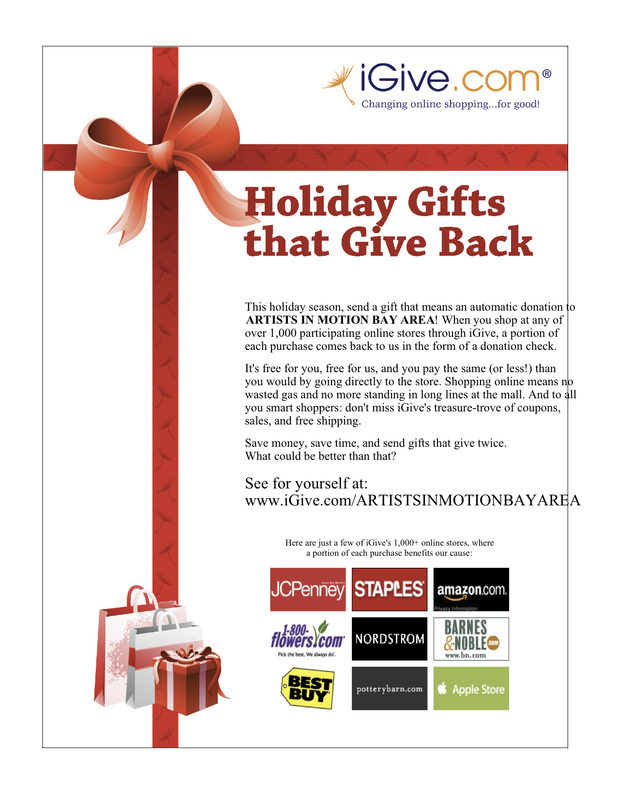 With iGive.com, you don’t have to choose between buying something or sending a donation to ARTISTS IN MOTION BAY AREA. Now you can buy the things you need, save money with exclusive iGive coupons and deals, and feel good knowing that a portion of each purchase benefits our organization. Free Ways to Help ARTISTS IN MOTION BAY AREA Raise Much-Needed Funds. Every time you shop at any of the 1,000+ online stores in the iGive network, a portion of the money you spend benefits ARTISTS IN MOTION BAY AREA. It's a free service, and you'll never pay more when you reach a store through iGive. In fact, smart shoppers will enjoy iGive's repository of coupons, free shipping deals, and sales.